← How to convert specified pages of PDF to Word? If your friend sends you a variety of useful PDF documents and you want to browse them, you will need a PDF viewer installed on your computer. Some basic functions about the PDF viewer must contain such as zoom in or out the document page, resize the the page of document, scroll the page or jump to some number of page. Based on these demands, you can choose the application PDF Editor as your tool because it can meet all the requirements mentioned above. In addition, it is also a good editor for PDF document and a powerful document converter which can convert many kinds of files to PDF document. For using PDF Editor, please download it at www.verypdf.com/pdf-editor/pdfeditor_setup.exe and install it on your computer. You can create a desktop icon for the application for your conveniently working. If you want to buy the application, please enter its homepage at http://www.verypdf.com/app/pdf-editor/index.html. Now you can launch this PDF viewer. Please open PDF Editor via double clicking the desktop icon or right clicking the icon and clicking “Open” option in dropdown list. You can also click “Start”—“All Programs”—“VeryPDF PDF Editor v2.6”—“VeryPDF PDF Editor” to open the application. Then please open the PDF document you want to view in this PDF viewer. Just click “File”—“Open” or click “Open” button in the toolbar of PDF Editor to open “Open” dialog box which enables you to choose the PDF document and add it into PDF Editor. If you don’t like this two ways, please use the shortcut key “Ctrl”+ “O” to open the dialog box. 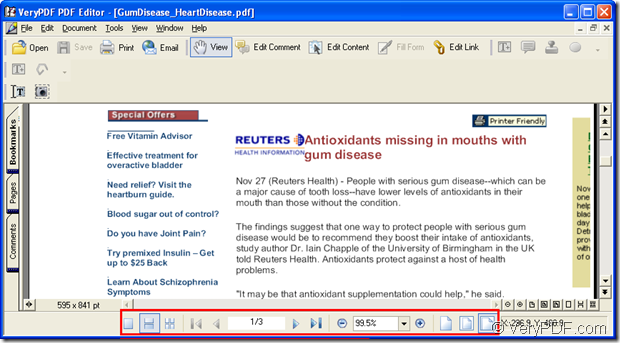 Please see the main window of PDF Editor in Figure 1. For viewing the PDF document, there is a toolbar which contains many function tools below the document pane. The Page zoom tools and page resize tools allow you to resize the pdf document without any loss of quality, which due to the nature of pdf document. The PDF Editor supports zoom resolutions from 12.5% - 500%. Click “Zoom out” on the toolbar or “View”— “Zoom out” on the menu to scale the page in decrements of 10% each time. Click “Zoom in” on the toolbar or “View”— “Zoom in” on the menu to enlarge the page in increments of 10% each time. For zooming in or out the current page of PDF document, you can also right click the document pane and choose “Zoom In” or “Zoom Out” in the floating item. Click “Actual Size” or “View”— “Actual Size”, the size of the page will be 100% of the actual one, no matter what the size of application window. 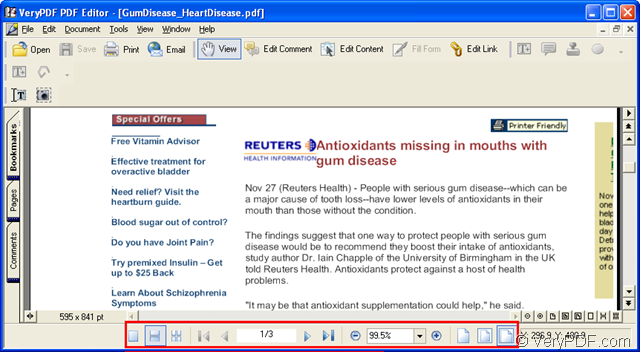 Click “Fit Page” or “View”— “Fit Page”, one whole page will be displayed in the document pane, and its scale proportion is according to the application window size. Click “Fit Width” or “View”— “Fit Width”, the page size will be regulated to a fit width to the application window. You can choose the continuous page modes by using the tools . You are also allowed to change the current page to some special page by inputting the page number in the box . So if you want to learn more functions or more features about this PDF viewer, please read its user manual by clicking the following link: http://www.verypdf.com/pdf-editor/pdf-editor/index.htm.